You have played this game before in many different incarnations. You are the underdog fighting against the mighty powers that be one step at a time on your path to right a great wrong committed against your family in the past. For anyone who has played RTS games, the mechanics are familiar: Gather resources while improving your infrastructure to increase efficiency of resource gathering and the strength of your troops and create soldiers whose strengths compliment the weaknesses of their comrades. 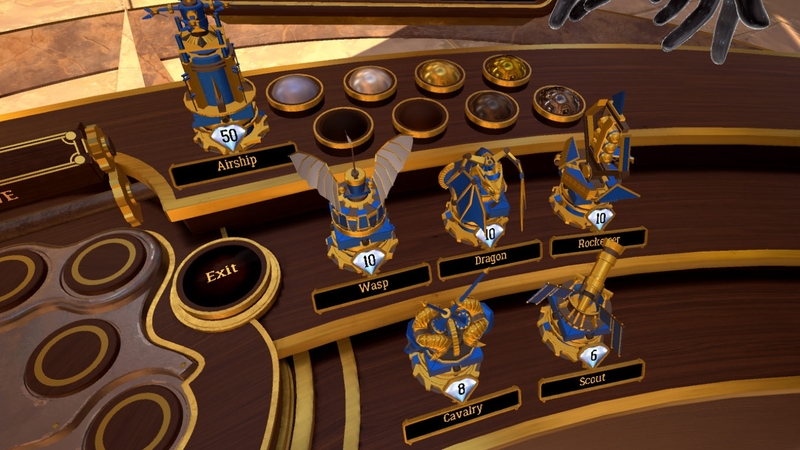 At face value Brass Tactics doesn’t sound like anything that is blazing a new trail in the multitude of VR titles but once you open it up and start immersing yourself in the gameplay a smile will find its way onto your face. One issue I have had with VR titles is at times controls can become so cumbersome you find yourself waving your arms about in a manner reminiscent of that guy wearing the tin foil hat on the street corner talking about the NSA wiretapping tacos. All the information you need is immediately visible on your hands in game. You can see your current unit, ore and jewel counts prominently displayed on your wrist interface. This also possesses a convenient status bar showing the duration to wait and how many resources your minions will bring in. You are able to intuitively glide along the map with a press of a button while changing the elevation of the map by pulling up and down with both controls. To bring up the build menu you turn either hand to face palm up and select the troop tower you wish to construct from the options that are presented. To recenter your VR view, press into both thumb sticks at any time during the game. Any good RTS starts with unit selection. The detail of the map is an integral aspect of the fun to be had. Back in the day of playing Warcraft 2, StarCraft and Red Alert when they hit the scene, (yes, I am that old) one of the aspects I really enjoyed was the attention paid to the units and structures in the animations when they moved or were constructed. 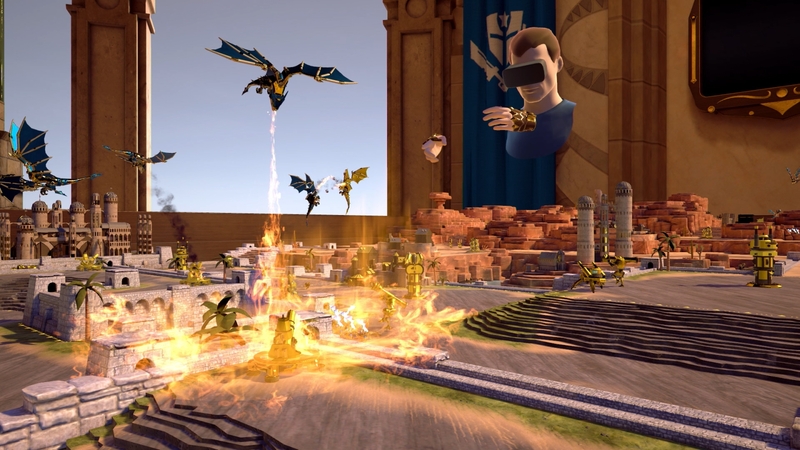 Brass Tactics takes this a step further as upgrades to your primary castle and construction of towers are done in the style of the opening credits of Game of Thrones. The fact that Aidan Gillen, otherwise known as LittleFinger, is a voice actor of one of the antagonists only adds to that flavor. You can zoom in to see the myriad of parapets, towers and other structures come to life as they construct themselves into their upgraded states. The map itself allows you to roam about and look over the terrain as you can go down into ravines and watch the new territories you claim bustle with activity. Unit management is quite simple with point and click to group multiple squads as a larger group or to assign them orders to hold their ground or attack. Cleanse with fire — the best solution for most problems. In the game itself, resource acquisition is automated as when you take an area of the map the local HQ of that region will begin to produce mechanized minions to go forth and gather your loot. You can upgrade the number and speed in which the minions perform their thankless tasks but overall you are free of the resource grind and left to wage the larger battle at play. Claiming a neutral area is a 2 phased approach of moving troops to the area and then placing a troop tower on a beacon slot. This allows you to immediately create troops in that area while building gun tower fortifications to hold the enemy at bay. As there are a finite set of these beacons you can place your troop towers upon, you need to think how you want to wage your war. 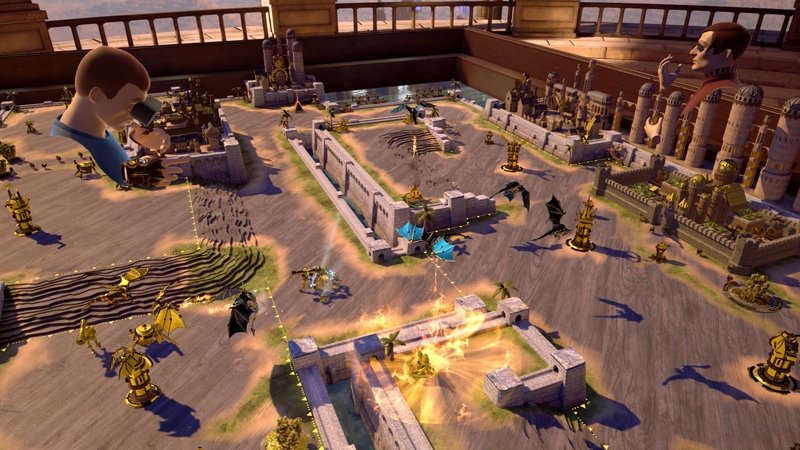 Brass Tactics supports a single player campaign, as well as co-op and multiplayer. As you upgrade your main palace, you will be presented with options to upgrade the units you are able to produce at that time. This allows you to really customize your troops to fit the kind of game play you want to indulge in. Each unit has 2 stages of upgrades it can achieve in a hierarchical manner so to get the tier 2, you have to invest in the tier 1 prior. This really comes into play as you can only upgrade your palace to tier 3 and you have to select which unit upgrades you wish to purchase at the time of the palace upgrade. As Brass Tactics leverages the time honored rule of “no takebacks”, you might find yourself out of upgrade slots to advance some of your units the way you want. As you advance your palace’s tier level, you will be able to make more advanced units. There are 3 tiers of units that fall under the usual categories of melee, artillery, anti-air, flying and medic units. There are variations within these unit types that are further defined by the upgrades they can each receive. Your basic melee warrior can be upgraded to a veteran unit that makes them stronger all around. You can then upgrade another slot beyond that and choose to make it a stealth unit that cannot be seen when not fighting or you can juice it up with automaton ‘roids and give it electrically charged weapons. One of my personal favorites is an upgrade that converts your basic worker gathering resources into a suicide bomber that will charge the gates of the enemy in your righteous name. If an enemy unit get to near as they make their sacrificial pilgrimage, they will most happily use the opportunity to send them to the machine version of Valhalla. Great item to use when making that push to decapitate the enemy for a victory. You can only create your own army rosters of what troop towers you can have access to in game which further customizes your troop options.